Steel wool is the name given to fine metal wire that are bundled together to form a cluster of abrasive, sharp-edged metal strips. The metal strips are massed together in a sheet, folded, and turned into pads that are easily held in the hand. These steel wool pads are used for a variety of purposes, but primarily as an abrasive material, sometimes replacing sandpaper. Steel wool may be best known to consumers as the pink-colored abrasive pads that have soap added so that they may be used to scrub pots and pans. Steel wool comes in a variety of grades, or thicknesses, from coarse to extra fine. The coarser the wire, the more abrasive the steel wool is against the surface. Fine sanding is always done with the finest steel wool grade (generally referred to as extra fine). Steel wool is made by a few manufacturers in the United States, but a fair amount of it is made overseas as well as in Mexico. Steel wool gets its name from the fact that the fuzzy, grey mass of metal strings resembles wool before it has been carded and in some ways does resemble a fiber. It is not, however, truly spun as is a fiber. Instead, steel wool is produced by pulling metal rods through a series of metal dies that slice into the rods and cut away unnecessary metal—a process known as drawing. The rod is thus reduced to a fine strand, with the swarf or metal that is peeled away utilized in other products. The production of steel wool generates heat as the cutting tool slices into these metal rods. Fires are a hazard during the production process and necessitate careful watch. Oil minimizes this fire hazard by reducing friction. However, the product does contain some oil, and manufactures and purchasers of steel wool need to be aware of the oil content as the product can spontaneously combust even beyond the factory. Steel wool must be stored away from electrical outlets or other sources of electricity or flame. For many years the properties of small pieces or circles of metal were recognized for their ability to clean and cut through grease and grime, particularly those embedded in metal. The Victorians used peculiar pot-scrubbers that had a metal wire handle to which was attached many dozens of small circles of steel intertwined. Referred to as wire dish cloths, these scrubbers were touted as "the most convenient and most popular utensil extant." The scrubber was submerged in soap and water, then pressed against cast iron or aluminum pots, cleaning the surface easily. However, mechanics who ran metal lathes noticed that the metal shavings resulting from peeling away metal from a part or tool was an interesting bit of waste. It is said that well before 1900, mechanics gathered up this swarf and used it to polish metal surfaces. A steel wool cutting machine. that these pads were necessary for cleaning the newly invented aluminum cookware that had started to overtake cast iron pots. One pot salesman had so many complaints from housewives about the difficulty of cleaning their new aluminum pots that these pads were a gimmick to get the women to try the new pots. They worked wonders in cleaning and still do, although some are unhappy with the fact that these steel wool pads can rust if left on the sink wet. A replacement for these pads has been a sponge, resembling steel wool, made of a mass of synthetic fibers and is rust-proof. But the cutting edges of the steel wool cannot be duplicated in these colorful, synthetic pads. Raw materials used in the manufacture of steel wool includes the metal rod that is to be thinly shaved and made into wool. These metals may vary and can include low-grade carbon steel wire, bronze, aluminum, and stainless steel. The only other raw material used in the process is the oil that is put on the cutting tools to lessen the friction generated between metal rod and cutting tool. The entire cutting of steel wires into finely shaved steel wool happens on an approximately 50-ft (15.2-m) long machine called a steel wool cutting machine. The raw material is received at the factory and transported to the cutting machine with a forklift and readied for loading onto the machine. Skilled workers then take an end of a metal rod on the huge spools and wrap the end around the circular spool visible on one side of the cutting machine. Each spool has 15 grooves on the surface. Thus, each spool can accommodate the shaving of 15 spools of wire. The operators who thread this machine work very quickly and it takes them only a few minutes to thread the wire into the machine. As one spool runs out of wire, another spool is simply wound onto the spool, and the shaving process continues. As the cutting tool slices into metal, a tremendous amount of heat is generated. The tool must be kept cool with oil to reduce the chance of fire. Fire is a serious hazard in the production of steel wool; however, machine operators are fully trained to put out the fires. The cutting tool also dulls quickly and has to be re-shaped and sharpened approximately every three hours. Thickness of the product is varied by the size of the razor-like edges. The thicker the steel wool, the more slowly the product moves through the machine. After the wire has moved up one side and down the other, the cutting tools have fully formed the steel wool. The usable steel wool product is wound up into big rolls underneath the machine that weigh approximately 40 lb (18.1 kg) each. These large rolls are run through a machine that cuts the steel wool in length (perhaps 2 ft [61 cm]) and width, then rolls the strip and presses it into steel wool pads (if one examines a steel wool pad it is essentially a roll of steel wool that has been rolled to form a pad and can be easily unrolled, exposing all sides of the product to the surface being scraped or sanded). These steel wool pads are then hand-packaged in packaging that reflects the grade of steel that ranges from extra-fine to coarse. Large steel wool manufacturers cut over 2,000 short tons (1,814t) of steel each year. Quality of steel wool is measured for fiber thickness, oil content, and weight. Perhaps the most important factor in steel wool production is the consistent thickness of the metal rods used to make the thin metal strips. In order for the grades to be considered uniform and reliable, the raw materials must be of absolutely consistent thickness, ensuring that the product will be shaved at the correct thickness each and every time. Similarly, the cutting tool must be regularly checked for sharpness. Approximately every three hours, the cutting tool must be sharpened. If it is not, it may snag or the rods may not be cut consistently in the pyramidal shape and grade desired. Some manufacturers easily and quickly change out those blades and re-grind them using a blade grinding machine. It is essential that a grade is consistent in its quality. If a woodworker requires extra fine steel wool to complete final finish sanding before staining and coarse steel cuts into the finish, the surface is ruined. Too much oil in the pad is also detrimental. Excessive oil can prevent the pad from soaking up the product (stain or wood stripper) and can mar the surface with oil. In addition, excessive amounts of oil in steel wool can make the product combustible. 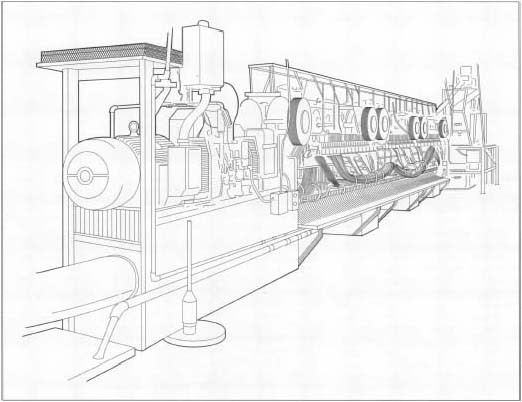 The left-over wire (the metal that is cut away from the metal rod and is not usable steel wool) is collected and sent out the back of the machine via conveyor belt and moves to the hammermill. Here, the hammermill chops the scrap metal into metal dust that is sold to the automotive industry and used in the formation of brake pads. The small, leftover pieces that remain after the metal rod is cut are rolled onto a spool and cut into smaller pieces. This scrap is sold to concrete companies and is increasingly replacing rebar as it is significantly stronger than the reinforcing bars currently used in concrete construction. Lint and steel wool dust, as well as fumes, are generally collected with a cyclone dust collector, thus keeping these particulates out of the circulation within the plant. Since the advent of steel wool, the product has undergone few changes. Soap has been added for use with pots and pans, and these steel wool types come in a handful of sizes and colors that are appealing to the consumer. In the future, consumers will see different types of grease fighting agents applied to the steel wool pads. New Scientist. http://www.newscientist.com (January 2001). SFI Steel Wool Machines. http://sfisteel-wool.com (January 2001).